Hiking to new places with a group of new people has always been one of my favorite pastimes, especially when I’m just beginning to get to know someone or meeting them for the first time. There is nothing like being outside discovering new places and seeing beautiful sites while talking with and learning about your fellow hikers. After an hour or two, the conversational awkwardness slowly melts away and people begin to feel comfortable with one another through their shared experience of walking a distance together. Although I have found this hiking comradery to be true among the adults and young adults I have had the great experience of hiking with, I would have never expected the same principle to hold true among thirteen rising 6th grade girls. 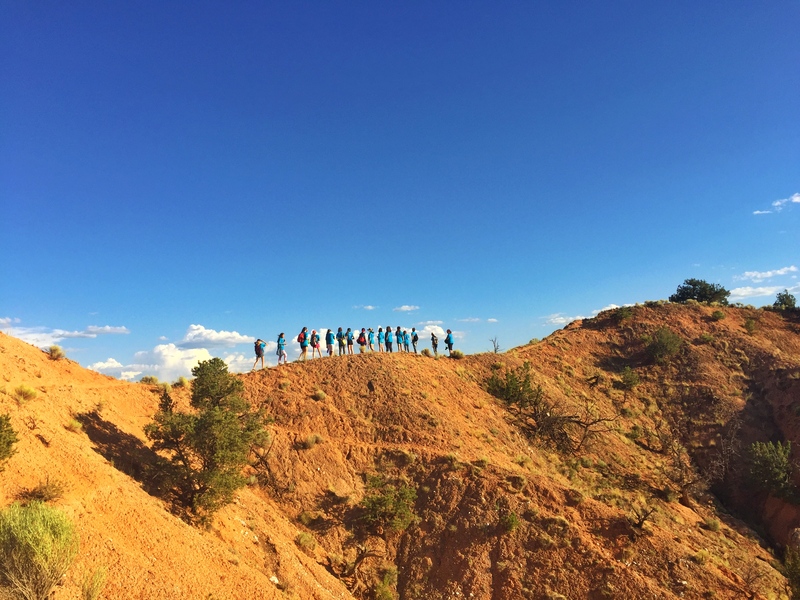 One of the many great experiences that the girls participating in the Georgia O’Keeffe Art and Leadership program get to partake in is visiting Ghost Ranch. At Ghost Ranch, we teach the girls about the history of the Ranch, Georgia O’Keeffe life there, and the influence of the surrounding landscape on her art. What better way to see the landscape than to hike through it, right? When we asked the girls who wanted to go on a hike after dinner, to my surprise, all of the girls wanted to come along. Hiking isn’t always everyone’s cup of tea, but everyone seemed enthusiastic and excited. As we roamed through the grass and brush, the dirt path gently weaved along the hill top offering gorgeous views of Abiquiu Lake and Pedernal as the late afternoon slowly started to turn to dusk. The girls stopped from time to time, enjoying the view unfolding below them. Some of the girls took turns using a staff member’s GoPro to snap goofy pictures with their fellow campers as well as capture the orange, grey and red layers in the surrounding mesas. Girls chatted with one another in small groups, discussing their friends from school, their funny stories, their inside jokes they developed during the past week together, and even their concerns about starting middle school this coming year. They ran along offshoot paths in order to get a better view of the area. They looked at different wild flowers and shards of varying types of rock. By the time the path had lead us back to the Ranch, all of the girls were smiling and eager to get back to the bunks for what can only be described as the much anticipated camp sleep over. At the end of each day, our program has a tradition of asking a closing circle question which all of the girls answer. Today was my day to ask the question. 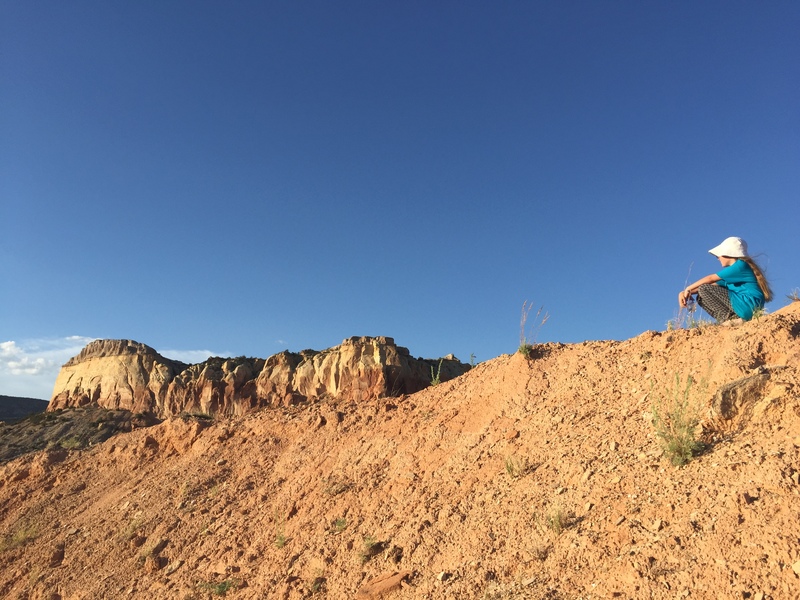 It had been the first time many of the girls had been to Ghost Ranch, so I decided to inquire what their favorite part of their day in this magical place was. Once again, to my surprise, it wasn’t dinner or the games we played that day that they seemed to enjoy most. Almost all of the girls replied that the hike was their favorite. It was on that hike that they talked, laughed and became just a little bit closer.